Looking at this interesting amalgam of a boat and a helicopter makes one wonder if putting a helicopter-styled body on a boat an attention seeking stunt or just a curious attempt at science exploration? The answer of course, is a bit of both. Helicat LLC is an example of a catamaran combined to a helicopter. For those who don’t know what that is, Wikipedia defines a catamaran (“cat” for short) as “a multi-hulled vessel consisting of two parallel hulls of equal size.” The idea of the creators is to combine the fast, steady, and frivolous properties of catamaran hull with a captivating heli design making it perfect for rough water, with the bounded cockpit giving added advantage against water collection inside like in a conventional catamaran. This Washington based Helicat 22 is manufactured with dual 60-hp and dual 90-hp model engines topping speeds of 69 km/h with the latter while 48 km/h through whitecap waves- call it a shooting star in rough waters! Measuring at 21.5 ft and weighing 1500 kg inclusive of trailer and fuel, it is designed in a way to be conveniently towed by SUVs and cars and boasts a capacity of up to 7 persons. Vinyl side doors are optional to protect occupants from getting wet and if they wish to experience the splashes and the open air, the doors can easily be removed. The manufacturers at Helicat added a tail on the back of this Helicat 22, not just to refine the helicopter influence but to act as water-ski tower. 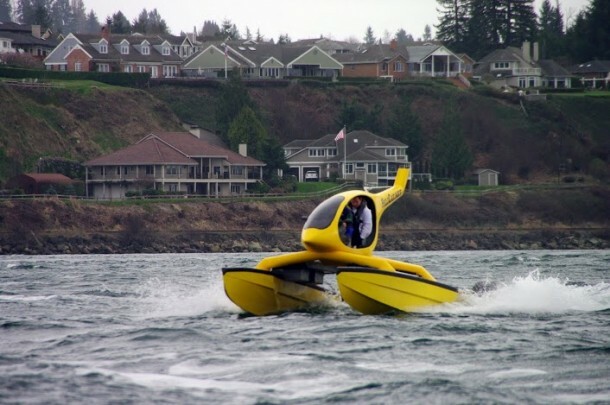 It further adds to the exquisite property of speeding through harsh waters; it can be used as a fishing boat, an offshore scuba diving platform or even a tour boat. This amazing invention is making appearances at all major boat shows since its launch last year and the good price only adds to its popularity. 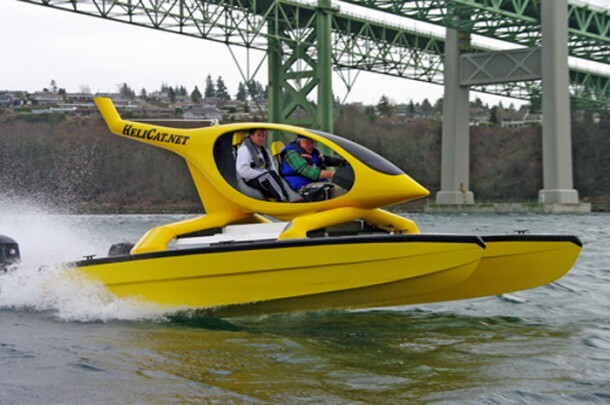 The 60 hp model engines are being priced at US$74,900, but good news is that Helicat is also advertising a demo unit for just $64,900 and a prototype for $29,900 (additional shipping costs about $5,000 in the US and $6,000 in other parts of the world apply accordingly). 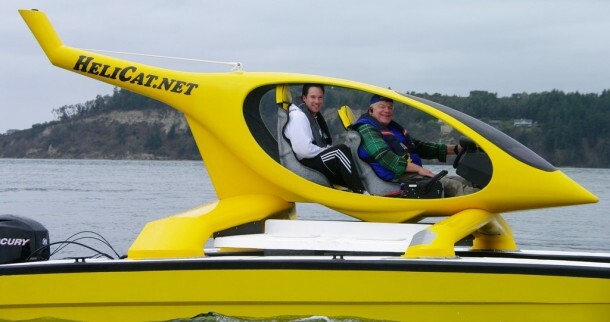 Those interested in such a fusion with a boat but are not keen about the heli on top; Helicat is more than willing to satisfy them by claiming that their craft can easily be converted by installing an actual sports vehicle or convertible body on top. Checkout the Helicat in its full swing on the water in the video below and imagine the thrill.